People have believed in flax seeds healthful benefits for more than 5,000 years. Today we understand the science behind the legendary claims and we also know how good they taste in our Flax Seed Artisan Nut Thins. We mix them with brown rice and almonds and bake them into a deliciously crunchy cracker. 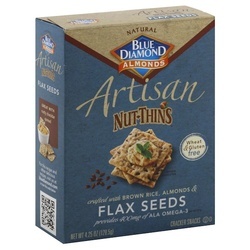 Enjoy them with dips, spreads, cheeses, or straight from the box for 400 mg of ALA omega-3 per serving.